While Motorola isn’t exactly the world’s most popular smartphone vendor nowadays, bargain hunters are constantly being treated to killer deals on respectable handsets like the Moto G6, Moto X4, and Moto Z3 Play. Hot on the heels of the G6 hitting a new all-time low price with upfront Sprint activations, the unlocked Z3 Play has gone down from $499.99 to an irresistible $299.99 under similar conditions at Best Buy. 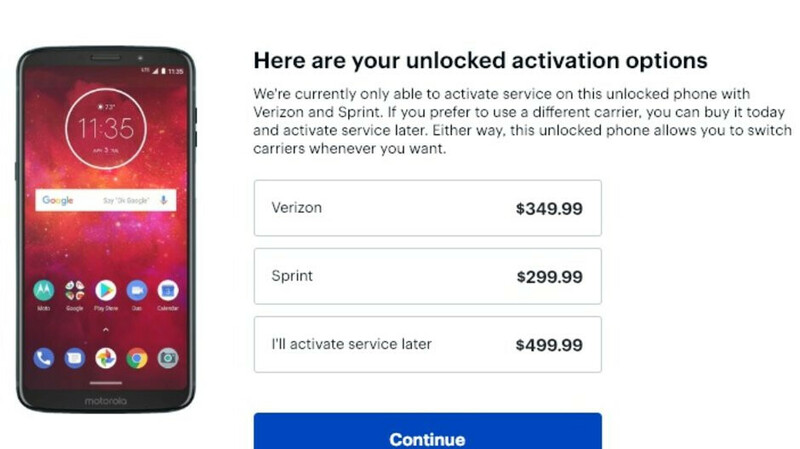 We’re talking obligatory Sprint activation for upgrading customers, although both new and existing Verizon subscribers can get the handset at a very reasonable $349.99 of their own. Technically, the Moto Z3 Play units on sale today are still unlocked, allowing you to switch carriers shortly after receiving the phone in the mail or picking it up in a physical store. You can obviously make the switch from Sprint or Verizon to a GSM network like AT&T and T-Mobile, so this is undoubtedly a much better deal than what Motorola and B&H Photo Video are currently offering. Meanwhile, Fry’s Electronics recently marked down the unlocked Z3 Play to 300 bucks with basically no strings attached, but we can definitely understand why you’d choose to do business with or at Best Buy. Don’t forget the modular handset includes a snap-on Power Pack accessory with 2,220 mAh capacity for no extra charge, substantially boosting its internal 3,000 mAh battery right out of the box. At $300 or $350, the Moto Z3 Play arguably has a lot going for it, from premium build quality to respectable Snapdragon 636 processing power, 4GB RAM, 64GB internal storage, fun 12 + 5MP dual rear-facing cameras, a sharp 6-inch Super AMOLED display, and Android 9.0 Pie software in the pipeline.